I particularly like her tarts but she also has some jolly good general recipes scattered throughout her four books and this is one of them. It is very easy to make and really, really nice. Maus, aka the fussy one, said the other night, “I like this”. Those who know Maus, know that is very high praise. This recipe is from Belinda Jeffery’s The Country Cookbook. As Belinda notes, sometimes you just don’t feel like cooking from scratch. On a day like that, consider this lovely dish. The recipe says to finely chop the ginger, lemon grass and coriander and then add them to the curry paste and coconut cream or you can do what I did – put them in my food processor, along with the coconut cream and curry paste, and blitz it a few times – voila! Put the chicken, along with the coconut mixture, in a dish or plastic bag and massage the marinade into the chicken. Set aside in the fridge for at least 3-4 hours or overnight. When you are ready to bake: preheat your oven to 190°C. Line a shallow baking tray with baking paper and sit the chicken pieces on it. Pour the leftover marinade over the chicken. Cook the chicken for about 40 minutes (The exact time will depend on the size of your pieces and whether they are on or off the bone), or until it is cooked and brown on top. Whilst the chicken is cooking, make the cucumber ribbons. Run a vegetable peeler repeatedly down the length of a cucumber to form long narrow ribbons, stopping when you get to the seeds. Rotate the cucumber and do the same again. Repeat with the remaining cucumbers, then put the ribbons into a large bowl. Again, the recipe says to finely chop the ginger, garlic and chillies – I crushed them in my new garlic twister. Either way (crushed or finely chopped), combine them with the olive oil, vinegar, caster sugar and sesame oil in a small saucepan, bring to the boil then remove it from the heat. Add lime or lemon juice and salt to taste. When cool, pour over the cucumber ribbons and mix thoroughly. Serve chicken with the cucumber ribbons and, if desired, Jasmine rice (I forgot about the rice the day we had it:). 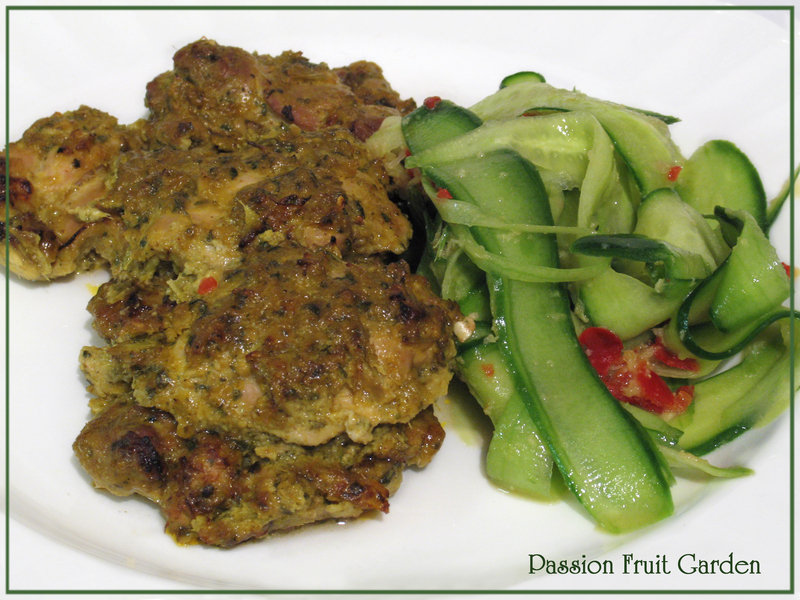 This entry was posted in Chicken & Duck, Cucumbers, Eating your bounty, What's for dinner? and tagged Belinda Jeffery, Marinated chicken, Tikka Masala by Glenda. Bookmark the permalink. Yummo! I thought you might have used a mandolin for the cucumbers they look great? How many lebanese cucumbers in 800g? I suppose you can keep the dressing and make only half of the cucumbers at a time, I’d hate to waste some of it. Hi Gail. I asked Maus how many cucumbers she bought. She said “Quite a few.”:) If you are making it for 2, I would halve the chicken – left overs would be good the next day – and just buy how many cucumbers you would eat in one meal – 2 or 3 I would think. We’ll have to dual over who is the biggest Belinda fan? I love her to bits – and more for the genuinely lovely lady that she is aside of course from all her wonderful recipes. If I were to publish a cookbook (and one day I will), A Country Cookbook is pretty much how mine will look – thats my dream anyhow. The cucumber ribbons have really caught my eye. Funnily enough I have chicken marinating as I type and I need some new ideas for side dishes. Shall give this a go. Thanks for dropping by earlier. Mariana. This is yet another winner for us Glenda. Looks fabulous and I bet it tastes delicious. Yum. Hi F&A It is and very easy to make.